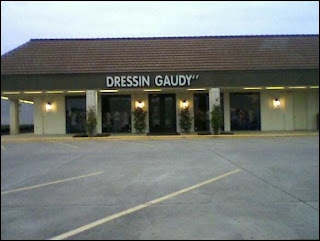 A friend of mine, Brad Klypchak, found this place across from a strip mall in Tyler, TX. Brad says that apparently nothing has fallen from the sign, since the name is spelled the same way in signs on both corners of the building. But if anyone should happen to find a missing "g" or a missing double quote mark, please let us know. And by the way, what an idiotic name for a business. Don't Trust Anyone under "40"